What do you do when your pre-teen child is unhappy and defiant, feeling depressed or alienated because she or he has PIMPLES? And they are only 9 or 10 years old! The situation obviously cannot be ignored, so how do you treat children with PRE-TEEN acne safely? Most people associate acne with the teenage years and accept acne as a normal part of growing up. More recently, pre-teen or pre-adolescent acne is gaining more attention from pediatricians, dermatologists and of course pre-teens along with their parents. In fact, in May 2013 the American Acne and Rosacea Society (AARS) published guidelines for the "Diagnosis and Treatment of Pediatric Acne" which was subsequently endorsed by the American Academy of Pediatrics. In part, this increased attention to pre-teen acne (ages 8-12) results from observations that this younger age group is now experiencing acne. A study published by Lucky et al revealed acne lesions in 78% of 365 girls ages 9 to 10. The fact that acne is occurring at this young age is an issue of special concern since the majority of clinical trials for acne medications are conducted in patients 12 years of age or older. As a result, there is little published evidence regarding the safety and efficacy of many acne medications in patients younger than 12 years of age. Start of the inflammatory cascade in people with more serious acne. As the causes of acne may be similar, should we also assume that the treatment may be? Unfortunately NOT, because younger children are obviously in a different development stage than older teens, and the medications used for older adolescents and adults have not been tested on pre-teens. As a result, a healthy dose of skepticism and special attention has to be given to this subject. So far, the list of available over-the-counter (OTC) options, products and prescriptive drugs for pre-teen acne does not differ from those that have been developed for teen and adult acne. And this creates a potential problem and requires active participation from parents. Benzoyl peroxide (BP), commonly used in topical products for mild acne. For younger children it is important to monitor for signs of skin irritation and a drying effect. If you opt to use it, start with the lowest concentration of BP. Just a side note - BP does not address the causes of acne but it can control the growth of bacteria that cause the inflammation. Topical retinoids are considered for all types and severities of acne in adolescents and adults either as mono therapy or in combination products and regimens. Topical retinoids can be associated with severe side effects such as skin irritation, peeling, and most notably sun sensitivity. Again - for young teens, these effects may be much more damaging. Therefore, the lowest concentration of retinoids should be used if this treatment is employed. Also keep in mind, retinoids address symptoms, not causes of acne. Topical antibiotics take a long time to work, and due to the possibility of developing of antibiotic resistance and other adverse side effects, they are not recommended as mono therapy for young teens for more than a few weeks. If used at all, they are usually combined with benzoyl peroxide. Topical antibiotics address the presence of bacteria, not over production of sebum. Oral antibiotics for moderate-to-severe inflammatory acne vulgaris are often prescribed by physicians. However, according to the American Academy of Pediatrics, tetracycline derivatives (tetracycline, doxycycline, and minocycline) should not be used in younger children. Oral antibiotics can damage tooth enamel and developing bones in pre-teens. Isotretinoin (known under the brand of Accutane or its generics) has been recommended for severe acne and chronic acne in older adolescents and adults. There is a clear consensus that NONE of the Isotretinoin containing products should be used for pre-teens due to the severe side effects associated with these products. It is clear that when evaluating the options for pre-teen acne, the preferred course of treatment should have the highest level of safety record and the lowest possible dose for this age group. Unfortunately, the rationale of most of the current treatments is similar for all ages and focuses on the treatment of existing pimples rather than the prevention of acne. This particular point was cited in the most recent guidelines from AARS which emphasize that the prevention of "microcomedones" (precursor to pimples on the surface of the skin) is a critical pre-teen acne focus. "The microcomedone is the not-clinically-apparent precursor of both comedonal and inflammatory lesions. It is a product of hyperactive sebaceous glands and altered follicular growth and differentiation. Reduction in existing microcomedones and prevention of the formation of new ones is central to the management of all acne lesions." The take home message from this rather complicated discussion is to look for safe products that will ultimately prevent pimples from forming. To date, the only product that is administered systemically that prevents new acne from forming is Isotretinoin, which, with all its highly publicized serious and long-term side effects, is absolutely NOT recommended for younger teens and, if even considered, is reserved (with serious caution and a full disclosure of possible health hazards) for the most severe cases of adult acne. 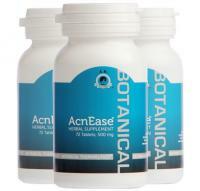 AcnEase® is a proprietary botanically derived natural medicine that prevents the formation of new acne.AcnEase® works to help the body to decrease sebaceous gland secretions, the hallmark for acne of all age groups. In clinical testing, AcnEase® has been shown to be both safe and effective, and has not been known to cause any adverse side effects while used short or long term. Most importantly, this unique Botanical Therapeutic® is not counter-indicated for younger teens that start to develop acne, and usually provides positive results with the use of the mild regimen. To learn more about AcnEase and how it can help, click here. Questions? Please contact us. We're here to help!